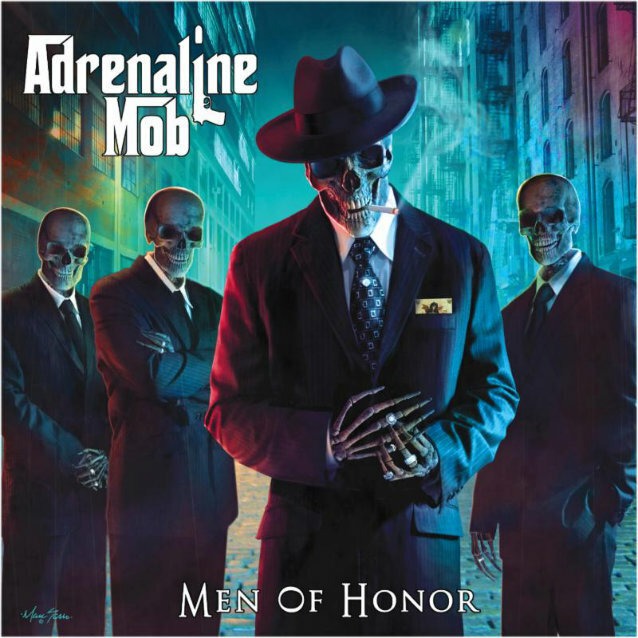 "Men Of Honor", the second full-length album from ADRENALINE MOB, sold around 3,600 copies in the United States in its first week of release to land at position No. 99 on The Billboard 200 chart. ADRENALINE MOB's full-length debut, 2012's "Omertá", opened with around 6,600 units to enter the chart at No. 70. "Men Of Honor" was released on February 18 in North America and February 24 internationally via Century Media Records. ADRENALINE MOB's current lineup includes Russell Allen (vocals; also of SYMPHONY X), Mike Orlando (guitar), John Moyer (bass; also of DISTURBED), and the band's latest addition, drummer A.J. Pero (also of TWISTED SISTER). "Men Of Honor" features 11 new original songs produced by Allen and Orlando. Drummer Mike Portnoy (FLYING COLORS, THE WINERY DOGS, DREAM THEATER, AVENGED SEVENFOLD) quit ADRENALINE MOB in June 2013 due to "scheduling conflicts." In an interview with Brazil's "Wikimetal", Allen stated about Portnoy's departure from ADRENALINE MOB: "He's been, obviously, real busy with THE WINERY DOGS. The truth of it is we wanna keep working, we wanna keep doing ADRENALINE MOB and we don't wanna wait around for Mike to have the time [to put into ADRENALINE MOB]. And he doesn't know when he will have the time again, so that's really what's going down. Mike Portnoy was asked to be in the band by myself. Me and Orlando had already written all the material, so [ADRENALINE MOB's debut album] 'Omertá' was completely finished before Mike joined the act. And it's a bummer, but he's got his sights on other things, and he's not gonna stick around. So we wish him the best of luck, but the MOB's gotta go on." ADRENALINE MOB released "Covertá", an eight-track EP featuring cover versions of some of the group's favorite songs, on March 12, 2013.